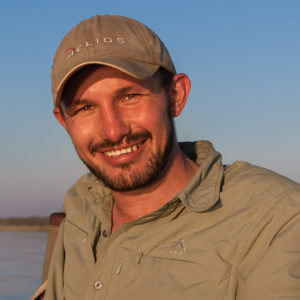 Etienne has an insatiable enthusiasm for African wildlife and an absolute passion to introduce people to Africa, so it was only natural for him to become a professional guide. A naturally creative person, he found his creative outlet was through wildlife photography and soon this became a core guiding skill that his guests appreciate. He completed a diploma in photography, to get a better understanding of the technical aspects of photography. With a natural flair for taking the creative route, he has become a sought after photographic guide and tutor. Etienne guides with a fresh perspective and offers photographers something a little different. He is constantly willing to share his own knowledge of wildlife photography with photographers around the world. Over the years he has shared magical moments with his guests while on safari, these opportunities have culminated in Etienne having a wide ranging and creative portfolio of photographs. Some of his images being published in many magazines across the world including (Getaway travel magazine, Go Magazine, Ranger Rick – National Wildlife Federation magazine, National Geographic traveler and Africa Geographic, Discovery – Cathay Pacific in-flight magazine) and a few photographs have gone on and done very well in numerous international photography competitions (BBC Veolia Wildlife Photographer of the year, Getaway Gallery, Windland Smith Rice & Nature’s Best Photography competition, Africa Geographic). In 2015 he was asked to author the advanced wildlife photography module for the Photography Institute, where he still tutors the students individually. His story has come full circle, with his photographic guiding background, he not only shares his knowledgeable with the guests but has started to mentor the next generation of guides about photography.